Cloud Computing is here and after a decade of powering the growth of small and medium business success, it is giving the tools and technologies that are needed to compete head-on with the giants. Back in 2018, cloud computing become a must-have technology for every enterprise, and it is no longer considered as a place to get some cheap servers or storage and 2019 promises to be even bigger into cloud technologies. As the competition heats up in 2019, the industry will come with the biggest cloud providers. The combination of low-cost infrastructure plus high-value development services is firmly establishing cloud as the new enterprise digital application platform, driving up spending on cloud even faster than that was predicted only a few years ago. What is ahead in 2019? 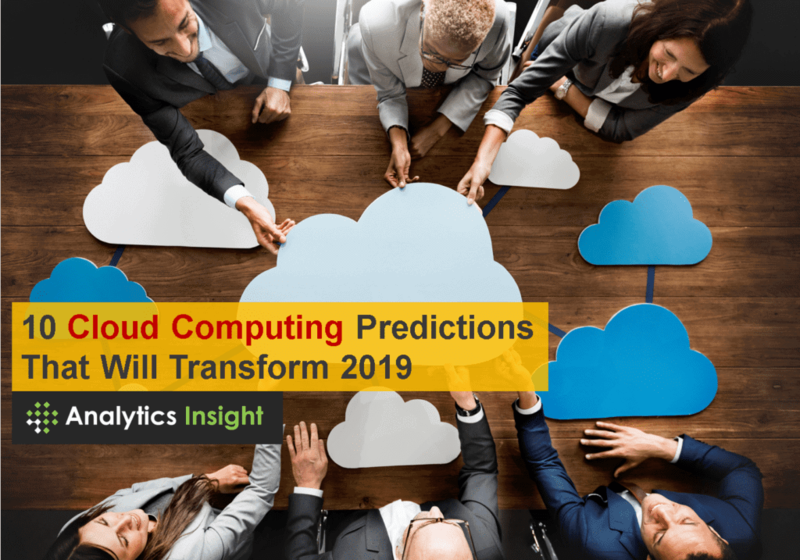 That’s what we will try to let you know here, with our 10 cloud computing predictions that will transform 2019. In 2019, spending on the could technologies will surge high as companies race to modernize existing apps and processes for new data insights derived from the piles of data collected through legacy systems. This will be done, with new investments into SaaS apps, using new cloud-native techs like Kubernetes, containers, and functions. Companies today are vouching up for hybrid-cloud environments to split data and workloads between on-premise clouds and public providers or enterprise managed cloud providers. Enterprises are vouching up for multi-cloud environments that leverage multiple public cloud providers or are simply buying software-as-a-service (SaaS) to outsource it to the vendor who will manage everything. These complexities increasingly require orchestration and expect to see hybrid-cloud/ multi-cloud orchestration suites gaining prominence in 2019 as cloud managers work overtime to reduce complexity while increasing the visibility into costs and consumption. 2019 will continue to see massive democratisation of technology ranging from virtualisation and hypervisors to cloud management tools and technology. This democratisation will be led by open source technology which will happen across the board from the application stack to operating systems. The developer sphere will be the key driver to this shift, and will become an important influencer in 2019 and beyond. In 2019, be ready for specialized services which focus on applications that suit to individual organisation or person such as blockchain integration, mobile technology and more. Cloud computing offers a plethora of capabilities for businesses by rendering the services in different models such as Integrating-platform-as-a-service (iPaaS), Data-platform-as-a-service (dPaaS), Blockchain-as-a-service (BaaS), Function-as-a-service (FaaS) and Mobile-backend-as-a-service (mBaaS). With enterprises moving to the cloud, data engineer’s role is unlocked in new ways. More and more organizations are taking advantage of data processing and analytics in their core businesses. It is predicted that developers need to expertise themselves with data processing engines like Spark, to understand the data processing engines. AI and machine learning functionality and development platforms started gaining prominence into public cloud provider’s offerings back in early 2017 and since then there is no stopping. In 2019, we expect to see this trend accelerate as digital transformation efforts move companies off of the digital sidelines progressing into the cloud. When any new proposal is discussed with new customers, there is a disconnect that is felt between an organisation’s historical training programs and the skills required by their teams in order to be successful. It is often seen that in spite of the training being offered, the final outcome does not align with technical goals. In 2019, we predict that organizations will appoint Digital Skills Officers to help manage their team’s technical skills to create structure in their training efforts. There Digital Skills Officers will be working closely with the office of the CTO and CIO to align training efforts with technical roadmaps, with an increased focus on contextualized training to drive successful learning outcomes. With organizations shifting their operations to the cloud, the capabilities of the data engineer role will be further enhanced. With more and more organizations leveraging data processing and analytics to run their core businesses, 2019 predicts that expertise with data processing engines like Spark into data engineering will become increasingly important for full-stack engineers and other computer science related roles. Containers are specialized operating system virtualization which can be used to run any application. Put into simple words, a container has all the necessary executable files, libraries, binaries, and configuration files, which are ready to use. Containers play a pivotal role in the current day’s cloud implementations and have taken the IT world by storm due to the portability they offer. In 2019, we expect a rise in containers, especially in the micro-services segment. When the cloud technology was new, it was thought that IT would simply offload most of their infrastructure and applications to the cloud. While some companies have achieved this goal, but for most this has not really happened, as most legacy systems continue the run in-house on corporate-owned and managed infrastructure. As companies adopt cloud applications for new services and functionality, we expect these older systems remain in place. In 2019 and beyond, companies will enhance their legacy applications by leveraging the cloud functionality including new database technologies, edge computing solutions for IoT, AI and machine learning capabilities to help bring new life into old functionality. Previous articleDon’t Fight the Robots. Tax Them.